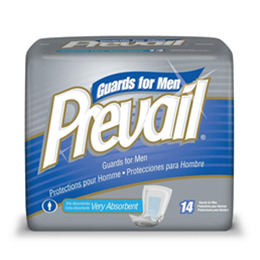 For Light to Moderate Incontinence ProtectionPrevail® Male Guards are body-shaped pad inserts with Cloth-like Outer Fabric designed for stress and urge incontinence. Featuring the Target Acquisition Zone and the Blue Stay-Dry Strip, liquid is quickly wicked and locked away from the skin for ultimate skin dryness, leakage protection and odor control. 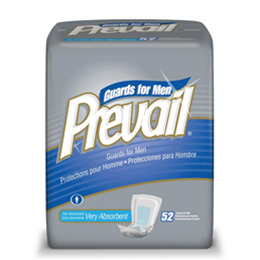 With a full-length adhesive strip for secure anchoring, Prevail® Male Guards offer the ultimate in discretion and protection.